I admit that I’ve been talking about my new brand obsession with all the enthusiasm of someone who’s just scored themselves a fabulous new friend (you know the kind, the ones with great style, rich girl hair, fabulous taste in everything and yet still impossibly nice)! I might have mentioned my new lust label with such a frequency my husband started referring to my “new friend” Kate. 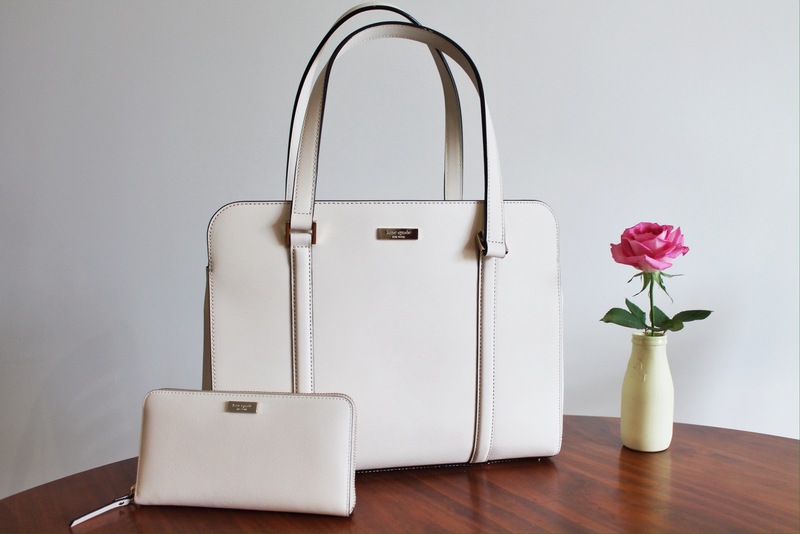 But, in my defence, what a good friend Kate Spade would be to have! Stylish, bold, colourful and fun, Kate Spade is definitely my new inspiration as I try and define my style. I have been in love with Kate’s handbags, jewellery, fashion and homewares for years now (yes, we are on a first name basis now). But until recently it was a long-distance love affair because the American brand was incredibly hard to find in our dear country. When I heard a store had opened in Melbourne I made sure to visit on our holiday last year and introduce myself. It’s fair to say I was a bit awestruck; I bought a brand new wallet and wistfully admired bags I couldn’t afford and so the obsession began. When we locked in our travel plans this year for Hawaii I was told by friends I had to check out the new Kate Spade outlet store while on holiday. To be prepared I may have done a little online browsing in advance and made the decision then and there to save up and buy myself a brand new bag. There are three different Kate Spade stores on O’ahu – the flagship store right near our hotel on Kalakaua Avenue in Waikiki and full of gorgeous things and there is also a store at the gigantic Ala Moana Shopping Centre. It was at the Waikele Premium Outlets though where I found my version of shopping heaven! When I entered, a lovely staff member informed me there was a 50 per cent sale on every single item in store. This was on top of the already discounted outlet prices. So $400 bags suddenly were on sale for as little as $120! Yipee! I was so excited/overwhelmed/childish that I probably lapped the shop ten times (with my poor husband in tow) trying to decide what would be flying home with me. I was eventually won over by a soft cream structured handbag with gold detailing and matching wallet. The big guy also helped me pick out a seriously cool cross body bag with amazing detail and quality finishes. A rose gold bow ring and some crystal earrings also made it onto the checkout counter surprisingly enough. More importantly though I left with some exceptional items that I use all the time and have taken my wardrobe to a whole new level. Now the holiday is over and I just look adoringly from afar, dreaming of when Kate and I will be reunited! 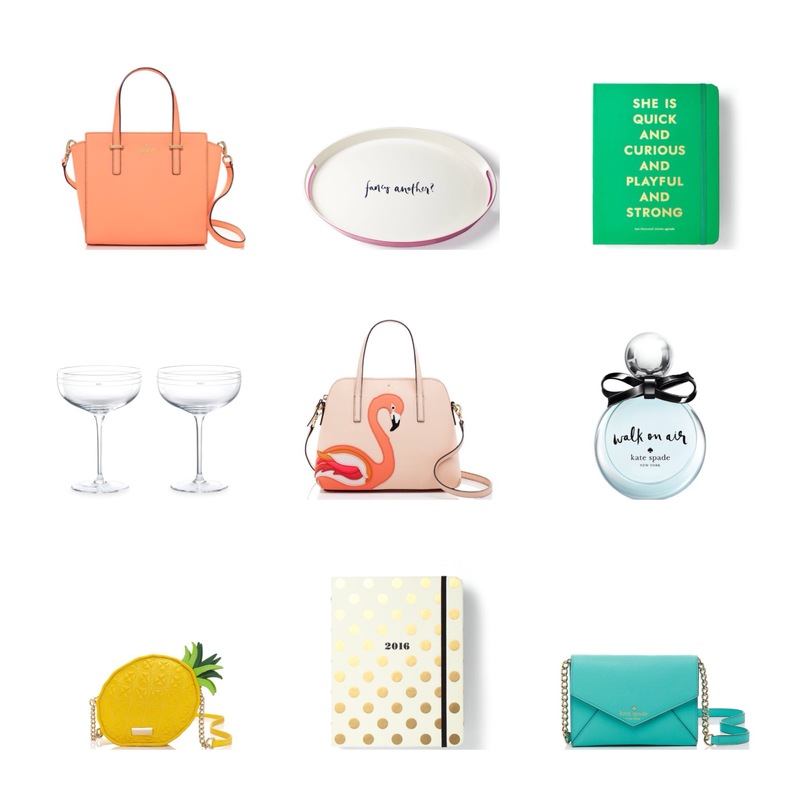 In Australia there are a few Kate Spade stores but you can also get some of their bags, accessories and homewares from a great Sydney store Papier D’Amour who offer online shopping and delivery! Alternatively you can buy from the Kate Spade online store and get items shipped to Australia but remember to factor in the US$35 shipping fee. FROM TOP LEFT: CEDAR STREET SMALL HAYDEN BAG, SALUT! MELAMINE SERVING TRAY, 2016 17-MONTH MEDIUM AGENDA- QUICK AND CURIOUS, DARLING POINT CRYSTAL CHAMPAGNE GLASSES, STRUT YOUR STUFF FLAMINGO APPLIQUE MAISE, WALK ON AIR 3.4 OZ EAU DE PARFUM SPRAY, WING IT PINEAPPLE CROSS-BODY, 2016 17-MONTH MEDIUM AGENDA- GOLD DOTS and CEDAR STREET MONDAY.